You would have to have been hiding under the proverbial rock to have missed the fact that virtual reality is becoming a big deal. And augmented reality? That could potentially be bigger, as evidenced by the recent Pokémon Go phenomenon. But what do VR and AR have to do with AV? The Brown University YURT project features 69 HD projectors beaming onto 145 mirrors, creating a 360-degree virtual display through Scalable Display Technology’s proprietary blending software. At the consumer end of the scale, VR certainly has a long way to go before it might be considered successful. As noted by Roy Taylor, AMD’s corporate vice president of alliances, at the VRLA conference in late 2016, the VR industry is attracting plenty of investment, but sales of headsets have yet to reach three million annually. Earlier in 2016, one research firm forecast that 200 million headsets would be sold worldwide by 2020. Compare that to the billions of movie tickets sold around the world every year. VR/AR is still in the first of the four stages of tech market development—hype cycle, facing reality, liftoff, and sustainable market—according to a report from San Francisco-based specialist consulting firm Digi-Capital. The installed base of headsets is expected to ramp up through 2017, but it will likely not top 100 million units until 2018, Digi-Capital reports. Those consumers who are even aware of VR know it as a portal into games and immersive entertainment. But in the B2B world, VR, AR (which has come to mean handheld device-based elements overlaid at arm’s length on the real world), and MR (mixed or merged reality, where virtual elements are superimposed over reality in a headset, such as Microsoft’s HoloLens) have been making great strides, and for many years. In the middle of last year, Stampede announced a North American distribution agreement with VRstudios, a Seattle-based provider of virtual reality solutions, with the aim of introducing a new product category to the pro AV industry. VRstudios’ technology is being used in construction, architecture, and aerospace, enabling multiple participants to, for example, walk through 3D rendered building plans, preview alternate room interiors, or tour a model jet using headsets. Potential applications in pro AV are obvious, especially to anyone who has experienced predictive speaker system modeling software. Bose Modeler Plus, for example, enables auralization of room models. 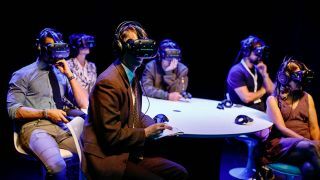 Imagine, in the future, potentially being able to virtually walk the room and audition the system performance at any seat in the house. VR initiatives are proliferating in education worldwide. Google Expeditions, for instance, allows a schoolchild in Lima, Peru, to visit the Great Wall of China, which they may never do in real life, said Michael Boreham, senior consultant at Futuresource Consulting in England. Cheap, even free, VR headsets such as Google Cardboard are powering such initiatives. Boreham reported that a start-up will shortly launch an inexpensive, mobile phone-enabled AR headset equivalent to the costly HoloLens. “Zappar set out with a crowdfund. They wanted to raise $35,000, and they raised $85,000. They’re going to sell this headset for around $30,” Boreham said. Rewind, a U.K.-based digital media production company specializing in VR, helped Jaguar launch its I-PACE electric car simultaneously in Los Angeles and London at the end of 2016. “The first time the 66 guests saw the vehicle was in VR,” said Oliver Kibblewhite, head of special projects. Rewind, a digital media production company specializing in VR, helped Jaguar launch its I-PACE electric car simultaneously in Los Angeles and London at the end of 2016. “The first time the 66 guests saw the vehicle was in VR,” said Oliver Kibblewhite, head of special projects. Wearing HTC Vive Business Edition headsets powered by Dell computers, the group, including celebrities such as Michelle Rodriguez and James Corden, could interact with one another and the presenters, and experience the car both inside and out. “They were wearing open-mic headphones, and we mic’d up the tables in Los Angeles and in London, so there could be a live Q&A with the presenters,” Kibblewhite said. But it’s the high end of VR/AR/MR that presents business potential for pro AV, especially integrators of these immersive solutions. “The very high end, where we live, is not necessarily a glasses- or display-based interface,” said Andrew Jamison, president and CEO of Scalable Display Technologies. Rather, these are fully immersive environments known as CAVEs: computer augmented virtual environments. The Brown University YURT project, for instance, contains 69 HD projectors beaming onto 145 mirrors, creating a 360-degree virtual display through Scalable’s proprietary blending software. The room-size environment accommodates multiple people. CAVE systems are often found at advanced education institutions. But Scalable’s largest market for CAVE systems is the military, said Jamison, in addition to architecture, engineering, and construction (AEC). “Suffolk Construction just put in three WorldViz CAVEs—WorldViz is at the top of the food chain when it comes to commercial AR applications—and are just now installing one of our Huddlewall products. That’s a wallsized workstation interface, 10 feet tall and 30 feet wide. Suffolk is doing visualization of [Autodesk] Revit models, 3D life-sized CADs of buildings,” said Jamison.